The scarce result forced a rethinking of capture protocols, which resulted in the marking of four red bats and three gray bats distributed, above all, in the upper part of Santa Cruz. After the first phase, experts wanted to understand the role played in the ecosystem by the two types of bats, which are differentiated by the size of their bodies. 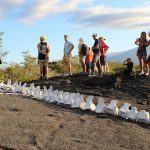 Then they will investigate the state of health of the bats and then genetic tests will be done to determine if the two species have some unique genetic characteristic for the Galápagos archipelago, located about a thousand kilometers from the Ecuadorian continental coasts. 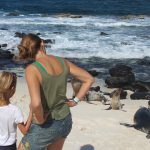 Galapagos is home to great biodiversity and natural wealth, you’ll be able to see some incredible animals such as penguins, land turtles, finches, iguanas, and sharks. For further information, please feel free to communicate with us, it will be a huge privilege to help you!